Apple Pay was introduced 18 months ago to rave reviews from the press and technology analysts. It was billed as an example of "mobile payments done right" -- simple, intuitive and painless. And yet, its impact has been muted at best, even in key western markets. According to a recent survey, 80% of iPhone 6 users had never used the service and just 3% used it regularly. 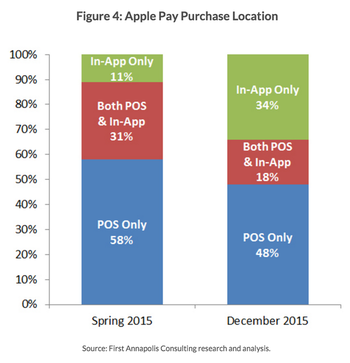 Customer satisfaction among Apple Pay users remains high, but word-of-mouth appears to have had no impact on adoption. What is the cause of this divergence? Looking at these figures, it appears that Apple Pay is struggling to "cross the chasm" between early adopters and mainstream consumers. Early adopters genuinely looking for a mobile payment solution would have no doubt been delighted by Apple Pay's implementation. However, most "normals" aren't specifically looking for a mobile payment solution. Any substitute to existing payment solutions has to be superior enough to existing offerings to break long established habits (in this case, pulling out a credit card). And it is here that Apple Pay, and mobile payment solutions in general, face a key challenge. From the perspective of mainstream consumers, mobile payments are no more "mobile" than a credit card or cash. Security and privacy have never been a draw except for a vocal minority. The only benefit left is transaction processing time or "convenience". Last year, most early adopters (and some analysts) argued that mobile payments were so much more convenient than existing payment solutions that it was only a matter of time until adoption exploded. Except, it hasn't. And the longer you think about it, the more superficial this "convenience" argument seems. If a "normal" iPhone user has to make a trip to the closest big box retailer, say Walmart, would Apple Pay improve his experience? Does saving ten seconds at the checkout counter matter when he has to wait ten minutes for his groceries to be scanned and bagged anyway? Even if the wait is a few minutes for other types of in-store purchases, the added convenience is minimal. At the very least, it isn't enough of an experience boost to change the deeply-ingrained habit of pulling out a credit card. Now, if the credit card itself could save a few seconds, it would be actively utilized. And that's a selling point for contactless payments, not for mobile payments. Now, this isn't to say that mobile payments are a completely failed experiment. The convenience argument does apply when the purchased product or service is delivered instantaneously. In other words, mobile payments are a much more elegant solution when used for digital purchases made on the smartphone itself (or order ahead solutions for in-store pickup). Here, mobile payments solutions add convenience by saving you the trouble of manually adding in your credit card or verification details. 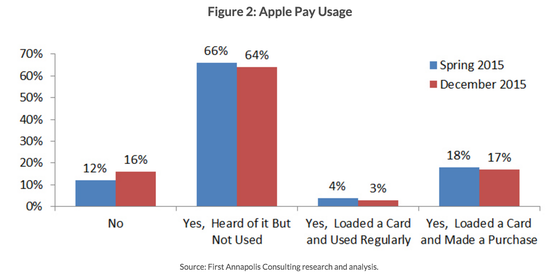 Unsurprisingly, this is exactly what the survey in question found among Apple Pay users. While Apple Pay usage remains low, the share of in-app transactions tripled during the survey period even among the early adopter base of Apple Pay users. Efforts to push in-store mobile payments haven't paid off until now and I don't see any trigger that will change this in the near future. It may be time for platform owners to pivot and focus marketing efforts on in-app transactions instead.